Hello Fellow CSA members. 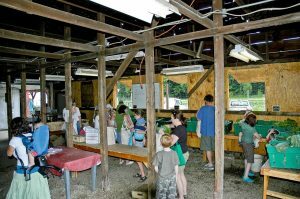 I am so excited to write for you for yet another wonderful Holcomb Farm growing season. I am Julie Wern, health coach, food writer, cooking instructor and author of Holcomb Farm’s Simply Fresh blog. Simply fresh is a weekly blog designed to inform, instruct and inspire the healthful, flavorful, and efficient use of your CSA bounty. The blog offers weekly tips and recipes on featured produce that include storage and preparation instructions, cooking ideas, and helpful tidbits. I thought I would post before our first distribution to share with you procedures. policies, tips and strategies to help you ready yourself for the upcoming weeks so you can be most efficient and creative with your bounty. Each year I introduce my readers to my pantry suggestions (click here) in which I list the major condiments, spices, fresh produce, grains, legumes, and other items I stock up on before the CSA season begins. With a full pantry I am prepared to meet the harvest head on in the kitchen with relatively few last minute trips to the conventional grocery store. Feel free to alter this list according to your personal preferences, but do note that these are the kinds of items you will most often see in my recipes. Another planning method I use is to schedule my weekly grocery store trip for a day or two after I pick up my share. Once I have my share for the week, I have a better idea of additional items above and beyond my pantry stash that I might need to flesh out the week’s menu. Before I reveal the rest of my general CSA tips, let me share with you the CSA pick up procedures and policies. I am writing now mostly to those who are new to the CSA and/or who will be coming to the CSA barn for pick-ups. Those of you receiving boxed shares at other distribution centers will find this section less relevant. The CSA season begins on June 12th and will end on October 27th. Pick up hours are Tuesday through Saturday from 10 am-6pm. 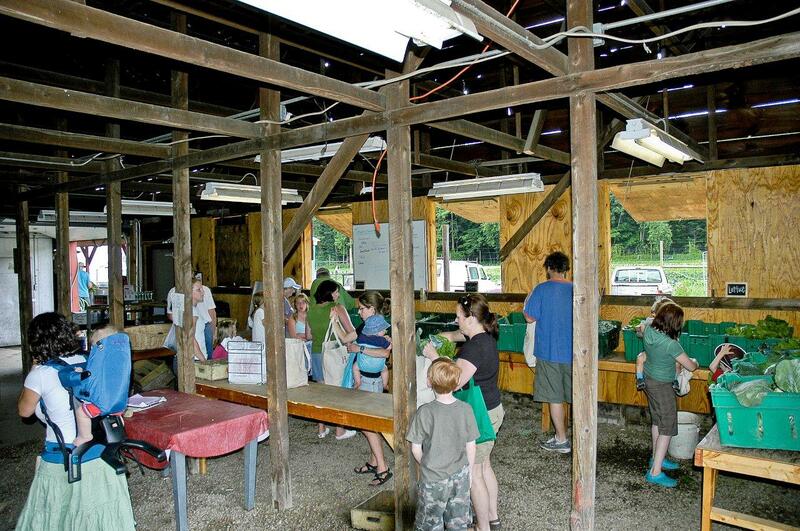 Pick ups are in the large CSA barn, down the road aways from the main Holcomb Farm buildings. No dogs are allowed in the CSA barn. On pick up days, as you enter the CSA barn you will be expected to check off your name on the member list located at the cashier desk. The produce will mostly be lined up along the walls of the barn. A chalkboard (and often signs in front of each item) will instruct you as to how much of each item a share or half share includes. Like last year, the farm will be offering its items with some choice. If you don’t particularly care for a certain selection you are allowed take up to ONE additional share (or half-share) of another preferred item in exchange for the unwanted one, for a maximum number of 2 shares (or half shares) of any given item. Please do not take more than your allotted share to ensure there are enough goodies for all members. If there is excess produce available at any given time it may also be offered for purchase. If you wish to purchase additional items a price will be listed for given amounts and purchases can be made at the cashier table (here you can also buy non-share grocery items that are carried in the farm store such as eggs, yogurt, and meats)(cash, check and credit cards are accepted). Sometimes I find it worthwhile to double or triple up on certain items by purchasing, say, a second bunch of chard or bag of spinach, as these items tend not to have a high yield when cooked, which is especially important if you have a large family. While there is typically a roll of plastic produce bags available for member’s use, the farm strongly encourages folks to collect and bring their own bags (plastic or paper or otherwise reusable). To limit the use of plastic and keep costs down, there is also a place to donate extra bags and members are encouraged to take these before using the bags purchased and provided by the farm. You will also want to bring your own re-usable shopping bag or box for carrying your bounty to your car. In the first few weeks of the season, one bag is typically enough, but as the season progresses you will want two or even three such bags to carry your haul. At Holcomb Farm we are fortunate to have Pick Your Own (PYO) gardens in which members are allowed to harvest their own items. A white board inside the CSA barn will provide maps to the gardens, alert you to what is ready for harvest, and inform you of the allotted share amounts. For the PYO items you will need extra produce bags and scissors. The farm has a collection of scissors for general use, but they quickly disappear so stashing a pair of scissors in your car makes things much easier. PLEASE BE CAREFUL WHEN PICKING PRODUCE TO STAY TIGHT TO THE BED THAT HAS BEEN IDENTIFIED FOR PICKING IN ORDER TO AVOID TRAMPLING CROPS PLANTED RIGHT NEXT TO IT. Designated Pick Your Own beds ready for harvest are marked by long sticks with colored “flags” on them. Please do not pick in areas without these markers as they are either not ready for harvest or are in danger of being over-picked. For harvesting in the fields I recommend closed-toe shoes, as you will be walking in dirt and mud. While it can be quite hot at the farm, long pants are often useful to avoid getting scratched or tickled by the leaves. Some bushes, like the raspberry patch, can leave one feeling pretty itchy! Bees can also be a menace. Sun hats are a great idea too. I haven’t really felt the need to bring garden gloves, but you may feel differently. In the early part of the season, plan for about 10-20 minutes of picking time. However, as the season progresses, you will need to extend that to up to an hour if you wish to take advantage of all the items available for harvest. Since many of you will be coming in high afternoon, you might want to consider doing your picking last and bringing a cooler with ice to place your bounty in for the ride home. Oftentimes tender produce picked in the heat of the sun and put into a hot car will wilt and deteriorate quickly. One of the most popular PYO items is the fresh flowers. Once the flowers are ready for harvest I highly recommend that you plan to bring a sturdy vase or bucket with water in it. Many of the flowers are very delicate and wilt quite quickly. Putting them in water right away keeps them fresh and perky. Many folks even bring their buckets right out into the fields so that the flowers get placed in water right away. Be sure to rig a way to transport your water-filled vessel home without making a sloshy mess in your car! My last tip is to really take time and savor the farm. The sights, smells, tastes, lovely people (and cats and dogs, and now pigs too!) have brought me such calm and joy over the years. I hope you come to love the experience as much as I have. Finally, a note about my blog. I write each blog post up to one week ahead. However, it is very difficult for Farmer Joe to give me absolutes that far ahead about the produce that will be offered in the upcoming distribution. Further, the unpredictable nature of farming also means that the distribution in one week may not be the same from day to day. I make every effort to guess the kinds and amounts correctly in order make each post relevant to everyone. However, there may be times I highlight a specific produce item that you end up not receiving in your share that week, or the amount in my recipe doesn’t match the amount you have been given. I ask for patience and a little creativity in these situations. Bookmark posts so you can refer to them later when you do happen to get that specific item in your share. Also, feel free to do searches on the website—I have marked each past Simply Fresh post with key terms to make searching by produce item a cinch. If you find you like what you read on my weekly blog, you might want to consider checking out my other food and lifestyle blog called The Wholesome Gourmande. In this blog I offer regular health and nutrition tips as well as delicious recipes and food preparation ideas. Use the search tool on the website to find information on produce items that are not discussed in a given week’s Simply Fresh blog post. Take your time, smell the flowers, and savor your experience at the farm!!! I would love to hear from you! What are your top tips for preparing for the CSA season? This will be our first season with the CSA and we are really looking forward to it! 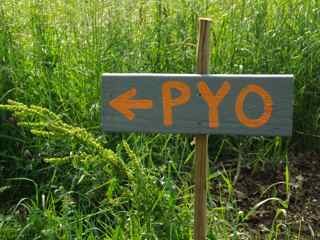 Will the PYO crops be priced on the white board as well or is PYO part of a share? Tracy, the PYO crops are included in the share. The amounts that can be picked for each item will be displayed on the white board in the barn each week. I do not believe that PYO crops are otherwise for sale, but you might want to double check that with a staff member when you are there. Enjoy and don’t hesitate to post any other questions. Looking forward to meeting you in the fields. Looking forward to another healthy season at the CSA and Julie’s great recipes – what to do with celeriac for instance. I always enjoy the challenge of figuring out how to prepare produce I’m unfamiliar with and Julie’s blog is a huge help, along with chatting with other CSA members, another great resource for information. Julie- very fine post and sugggestions as we start the season- P.
This is awesome – we are back to the CSA for the first time in more than 15 years – looking forward to it!